Neil Macdonald recently wrote the article "The Bank of Canada wields enormous power, yet decisions are made in relative secrecy," which questioned the Bank of Canada's secrecy, and its mandate. The article itself is somewhat curious, but it was written in response to a letter by 61 economists. The points raised by that letter appear to be more interesting. Given that I do not attach great potency to monetary policy, I am not particularly concerned about current arrangements. Even if the New Keynesians are misguided in their analysis of the economy, they cannot do a great deal of damage with interest rate policy. My comments are directed at the Canadian situation, but could be applied to other some developed countries with some modifications. In particular, the European Central Bank faces quite different issues. As a prairie populist, I am not enthusiastic about members of the Eastern establishment running a private club and making decisions behind closed doors. However, we have to remember that the Bank of Canada is a bank, and needs to operate like one. The first area of contention is the question of lender-of-last-resort operations. As far as an outsider can tell, these have not been significant in Canada, but were a major bone of contention elsewhere. These operations have to be done in secret, and only announced after they are finished (when it is too late to do anything about it). This has to be done privately since announcing that a bank is about to fail would obviously exacerbate any run, and would magnify the size of the operation required. Very simply, how would you like it if your bank announced the details of your financial situation on the internet? Since lender-of-last-resort operations are opaque, and opacity does not fit with current norms for government, the best course of action is regulate the banking system tightly so that such bailouts are not necessary. Canada did a better job than many other developed countries going into the Financial Crisis, but that is setting the bar very low. The next point of contention is the interest rate setting process. One alternative to having the central bank setting the policy rate is to have the Minister of Finance do so. Since the Minister would likely rubber stamp the recommendation of the Bank of Canada most of the time, I do not see any particular advantage for politicians taking that power. The obvious risk is a situation like the Lawson Boom in the United Kingdom -- where the Chancellor allegedly held rates at too low a level to fuel a politically useful housing boom. Given that the main way in which interest rates interact with the economy is via housing in the current environment, I am not too enthusiastic about the prospects of an interest rate cycle keyed to the timing of elections. If interest rate decisions remain with the central bank, the only plausible alternative is to open up the voting in a manner similar to that of the Monetary Policy Committee of the United Kingdom. It is clear that bringing in external voices adds to the entertainment value of central bank watching; we get to speculate about voting trends as there is more public dissension. That said, we just end up glorifying a handful of economists who are vying for public attention, and discounting the work of the rank and file researchers at the bank. Additionally, my view is that central banks are too transparent about policy. I think we would be better served with brief statements with vague suggestions about the views on trends in economic data. Instead of engaging in lengthy textual analysis of policymakers' statements, central bank watchers would be forced to do their own forecasting and say what they think the central bank should do. In this way, central banks might actually get some useful information from the private sector, and preserve some mystique about their forecasting ability. Listening to certain Fed presidents yammering on for years about the grave threat of incipient inflation risks in the first half of the decade did not do a lot for the Fed's reputation. For the purposes of this article, I am putting my "conventional economist hat" on, and arguing from what I see as the consensus economist views regarding monetary policy. It is entirely possible that the consensus is dead wrong about the effects of interest rates on the economy. However, it is up to the dissidents to prove the consensus wrong; it makes no sense to expect the central bank to set interest rates based on theories that are rejected by central bankers. If we return to the figure at the top of this article, we see that the Bank of Canada hit its 2% inflation target. Even though I did my best to make them look bad by showing headline (all items) inflation, it stuck within the target range most of the time. 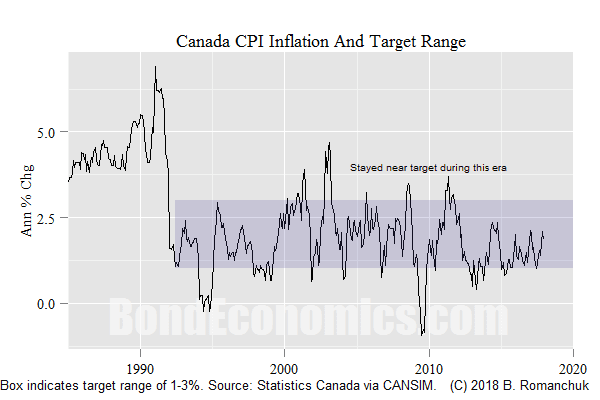 If we compare those deviations to Canada's pre-1992 inflation track record (the worst of which is lopped out of the time axis), the deviations from target are laughably small. The only mandate for the Bank of Canada was to achieve a 2% average inflation rate. The primary objective for the Bank of Canada was a 2% average inflation rate, with a secondary objective of achieving the greatest possible real growth (or lowest unemployment rate). The primary objective was growth, with a secondary objective of keeping inflation near 2%. Conventional economic beliefs explain why we cannot distinguish these three possibilities. The consensus argument is that interest rate policy can only nudge aggregate growth rates, and that inflation outcomes will be positively correlated with growth (assuming inflation expectations are anchored, which they were during most of this time interval). Even if the inflation target was viewed as secondary to growth, the growth was always expected to be coming. The only real disagreement would be if one believes that monetary policy should be extremely activist -- raising or lowering the policy rate extremely rapidly in order to try to speed up the economy's convergence to desired levels. (In control engineering parlance, this is referred to as "bang-bang control," and as one might guess from the label, it is frowned upon.) Such a strategy is a minority viewpoint, as it is related to the pump-priming tactics of earlier eras. Taking a more gradual approach to policy is now the consensus approach. One could argue that everyone was wrong about interest rate policy setting. Although that is possible, it still not address the obvious problem with that criticism: inflation was still near target. Even if policymakers were wrong about the effects on interest rates on inflation, they did not miss by much. A more targeted complaint is that the misses were of a particular type: the Bank of Canada cut off expansions too early. This has a political economy angle: wage increases at the end of the cycle are what helps restore the wage share of income. (I discussed the inflation/income share story in earlier articles.) So even though the overall inflation record was balanced, the capping of inflation had an effect on income distributions. Although I have some sympathy for that view, I would argue that the Canadian recessions of the post-1992 era were private sector led, not the result of policy. There was a fixed investment boom in the late 1990s (centred on technology) that ran out of steam when the tech sector imploded. A few rate cuts by the Bank of Canada would not have deflected that retrenchment. As for the 2008 recession, everyone is well aware of the deranged financial speculation that eventually blew up, taking out the real economy. The policy rate level was pretty much irrelevant in that environment. In other words, policy preferences of the Bank of Canada had little to do with the end of those expansions. The only policy stance that is not consistent with observed behaviour would be the Bank of Canada to completely ignore inflation, and just try to set the policy rate in a fashion to maximise growth. In other words, to turn back the clock to the Old Keynesian era. The question is: what would that accomplish? If we implemented such a change now, all that would likely happen is that the housing bubble would get even bigger (and implode in an even more impressive fashion). One could debate such a change, but it would require getting the consensus to accept a very different theoretical viewpoint. We are finally left with vague beliefs that the central bank can control inflation and simultaneously achieve other policy objectives. A typical argument is that the central bank should target financial system stability, and damp down on speculation. It may be possible to reduce speculation via regulatory changes; I wish the regulators luck on that score. However, that has nothing to do with interest rate policy. Should policy rates be set to dampen animal spirits in the financial markets? The problem is that central banks did make noises in that direction in the 1990s, and they ended up as laughingstocks. The entire institutional bias in the financial markets is to pump up risk asset prices. Everyone has high return targets, and the only conceivable way to get there is to jump into risk assets. The perma-bear community has been losing money for decades trying to bet against that tsunami of flows. In summary, it would only be worthwhile discussing changing the inflation target after the consensus changes its mind on how to model the effect of interest rates on the economy. Given that consensus has largely reverted to the economic thinking of the 1920s, I do not see that happening on any reasonable time horizon. Instead, the focus should be on using fiscal and regulatory policy to achieve objectives -- and those are the correct levers to be using. I remember Warren Mosler said something along the lines that the Fed is like a kid with a toy steering wheel. Anyways, I agree with you that cutting rates in response to a collapsing speculative boom is futile and the economy's sensitivity to rates aren't as strong as believed. Then what good is monetary policy for then? Short-run action for Fed watching portfolio managers to jump in and out of currencies and asset prices? Hiking rates “a lot” will force a recession. (In Canada, with our housing bubble still inflated, “a lot” might only be a few percent.) Cutting rates in a crisis helps psychologically, and given the nutty beliefs of risk asset investors, that is a useful thing. Hi Mr. Romanchuk! Very nice and comprehensive piece. I have a question regarding your views on pre-1992 monetary policy -- specifically the Fortin-Osberg view that the "Great Canadian Slump" was policy-induced, in that John Crow's inflation-targeting, with the accompanying divergence between real interest rates in the US and Canada, triggered the deep recession in Canada. I was a long-time believer in this, and, while I now believe this view tends to give too much credence to the effectiveness of monetary policy, it does seem to be defensible on MMT grounds, in the sense that these high real interest rates greatly increased, as Mosler puts it, the "savings desires of the private sector." In that sense, the issue was simply a failure of fiscal policy to accommodate these increased "savings desires." To sustain growth, we could have simply spent more, no? As Japan has done in an on-off fashion? I have not really looked into that debate, but I think it was the early 1990s? There had been a condo bubble in Toronto and Vancouver, so the channel from rates to housing was a concern. Otherwise, there were a lot of policy changes - fiscal, regulatory, so my feeling was that we cannot say it was just monetary policy. I was out of the country for part of that period, so I lost track of what was going on. From the perspective of a recent electrical engineering undergrad, the early 1990s recession was brutal. The short-lived “peace dividend” blew a massive hole in demand for electrical engineers in the US defence industry, and this then hit the civilian side. It was only when communications took off (internet, cell phones) that happy days were back for elevtrical engineering. The other thing going on in industry was that MBAs ramped up their practice of reducing headcounts. That started in the early 1980s, but probably peaked during that era. The “jobless recovery” was a reflection of behavioural changes in the private sector. 1. Tight Monetary Policy from the Bank of Canada as it officially adopted the 2% inflation target. 2. Increased Globalization and FTA/NAFTA. 3. The bursting of the Real estate bubble in Toronto (not just Condos, single detached homes dropped about 40% as well). 4. The Federal fiscal crisis which led to government austerity. 5. The election of an NDP government in Ontario which (perhaps unfairly) led to a loss of business confidence/animal spirits in the province. 6. The failure/takeover of all the Trust companies in the country. It seems that there are some lessons that could be learned from this era as I see some similarities to where we are today. It looks like the the tech boom of the late 90's combined with an undervalued currency and better US market access under NAFTA saved the day back then. I see some similarities to the circumstances today but also some radical differences. I'm not sure what could save us if the current housing bubble blows up or NAFTA collapses.